Full disclosure: ARC provided by WW Norton & Co. I honestly don't know that I have enough to say about this book to warrant a full review, but I want you to know about this book, so I'm calling this book buzz. 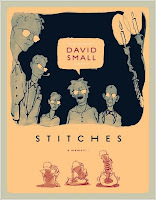 This is an intense and disturbing graphic novel memoir of David Small's childhood in a household so stifling that he literally lost his voice for years. When David was a teenager, he underwent surgery to purportedly remove a cyst from his throat. The horrible truth about his surgery wouldn't come out until years later. Creepy and gripping and brilliant and utterly brave, this is a story that shouldn't be missed. And I'm going to point you over to Travis's Toon Review. Consider yourself in the know. Put Stitches on your TBR list. It'll be on shelves September 8.